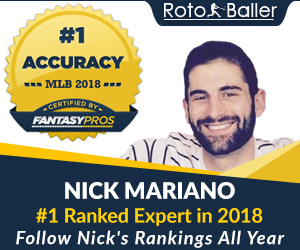 RotoBaller has partnered with RotoViz to bring you one of the most high-end fantasy baseball draft analysis tools ANYWHERE! We present to all you RotoBallers: ADP Arbitrage Draft Analysis for Outfielders*. The idea of this app is simple: Find draft day bargains. Here's how you use the tool: Select an Outfielder from the dropdown, and the ADP Arbitrage tool will analyze that outfielder and recommend three comparable outfielders who should get you similar levels of production at a lower draft day price. Simple as hell right? So, get to it, and find your draft day bargain! Why Just Outfielders? We're hoping to bring you an ADP Arbitrage tool for starting pitchers too. For the other positions, there's not enough depth or sample size to provide solid reliable "comparison" players. One caveat: the "comparable players" that are spit out are not ALWAYS "similar players" who you should target. No one is similar to Ryan Braun or Mike Trout. Net net, the app is not perfect, but it will give you good comparisons that MAY provide nice draft day bargains. As a quick example: I'll select Nick Swisher, who has an ADP of 109 this year. The app gives me Andre Ethier, Cody Ross and Ben Zobrist as comparisons. You can see from the numbers that Ethier and Ross had virtually identical numbers to Swisher last year, but Ethier and Ross are going an average of 60 picks and 200 picks later than Swisher, respectively. So, if you were planning on drafting Swisher, you can safely leave him for some other overzealous Swisher fan and instead draft Ethier nearly 5 rounds later or Ross 16 rounds later. As for Zobrist, he will be drafted as a 2B/SS where he's more valuable, so he can be disregarded in this case.